Scores of Christian churches across Egypt have been attacked by Muslim mobs as supporters of ousted President Mursi fight with police and military. The violent clashes follow the military’s seizure of power from Mursi’s Muslim Brotherhood this summer and subsequent crackdown on demonstrators loyal to the former head of state. 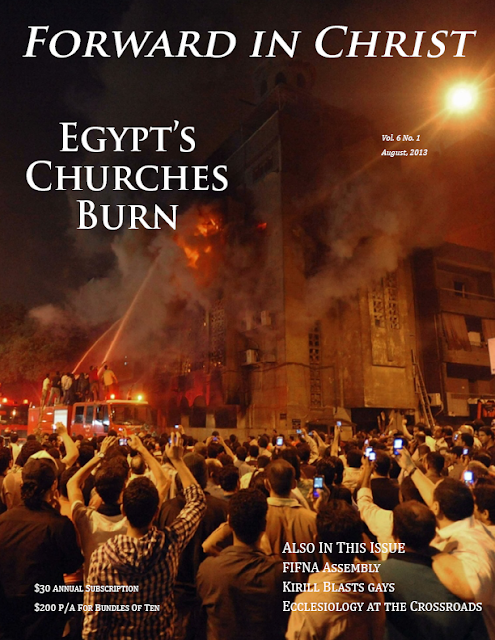 Partly urged on by anti-Christian fanaticism and the perception that Christians did not support Mursi’s government, churches have been especially targeted by enraged Islamicists. Anglican churches have been no exception. As I write these words, our St. Saviour’s Anglican Church in Suez is under heavy attack from those who support former President Mursi. They are throwing stones and Molotov cocktails at the church and have destroyed the car of Rev. Ehab Ayoub, the priest-in-charge of St. Saviour’s Church. I am also aware that there are attacks on other Orthodox churches in Menyia and Suhag in Upper Egypt, as well as a Catholic church in Suez. Some police stations are also under attack in different parts of Egypt. Please pray and ask others to pray for this inflammable situation in Egypt. Forward in Christ urges your prayer and support for Egypt’s Christians.